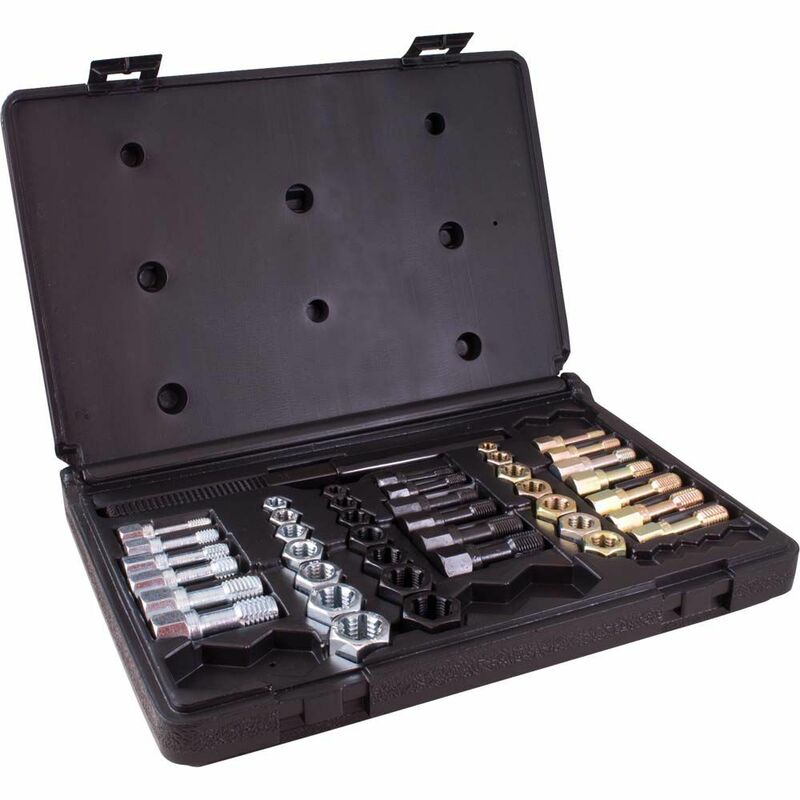 The taps and dies in this 42 piece set are ideal for restoring the stripped threads on old, rusty nuts and bolts. Hex shape makes taps and dies easy to turn with any socket or wrench. Made in USA and backed by Gray Tools worry-free lifetime warranty. This 32-piece ANVIL Homeowners Tool Set is designed to optimize work. Tools are made with quality metal and durable plastic. This set includes: retractable utility knife, 6-inch wrench, 6-inch long nose pliers, magnetic bit holder, 10 piece bits with stand, 16 piece hex wrench, 12 oz. hammer, 8-inch scissors, and 12 foot tape measure. The 17-Piece Smart Phone Tool Kit includes a precision screwdriver with interchangeable bits, a multi-size mini pry bar, sim card removal tool, Suction cup, tweezers and convenient storage case to keep everything in 1 place. This set provides you with the essential tools needed when repairing phones, tablets or other electronic devices. With a total of 12 bits and all the other essential electronics repair tools, this kit can help you get the job done. The welding locking pliers in this Grip-on 5 set feature a no pinch easy release lever eliminates painful accidental pinching of hands and fingers. Epoxy resin coating is 10 times more corrosion resistant than nickel and provides superior resistance to welding spatter. Made in Spain and backed by Gray Tools worry-free lifetime warranty. 42 Piece Rethreading Kit The taps and dies in this 42 piece set are ideal for restoring the stripped threads on old, rusty nuts and bolts. Hex shape makes taps and dies easy to turn with any socket or wrench. Made in USA and backed by Gray Tools worry-free lifetime warranty.